Angular 2 has improved the way we write custom validation. There are a lot of articles of how to do it. In this post I want to focus on how to build custom group validation in model driven development. I will build a custom group validation (CGV) that checks each item in the formArray that has a unique value. I use the FormArray class instead of FormGroup in the names field because the number of names is unknown; it is dynamic. The user can add multiple names. Now let’s see the custom group validation method. I used groupBy method of lodash library to detect if there are any groups of more than one item, which means that we have duplicate names. The result of the custom group validation is that every time we add or change name to a value that already exists in the formArray, the two formControl with the same value will be invalid. In addition the parent formArray will also be invalid. 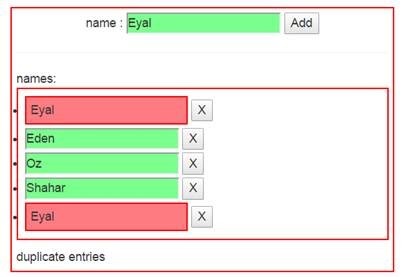 If I delete or change one of the duplicates names, the form will go back to be valid (in this case ‘Eyal’ name). I hope this information was helpful for you. Try the live example. This is one of many examples that I show in my AngularJS 2 course (.html"ng-course). The next course opens on 18 September. For more information click .html"heHYPERLINK "http://ng-course.org/ng-course/courses/angular2.html"rHYPERLINK "http://ng-course.org/ng-course/courses/angular2.html"e.
Thank you for the article. It helped me come up with a different take on this validator to allow any existing validations to also pass through. Please have a look at: https://gist.github.com/alsoicode/bcb7e56d7bc27d42c9ba7c70e91ee1c2 if you're interested.